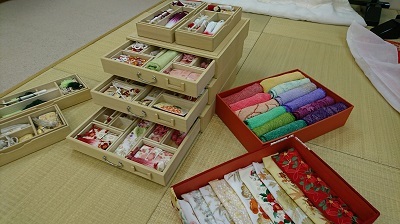 This uchikake is designed by Yumi KATSURA. In addition to the auspicious motives such as “matsu (=pine tree)” and “tsuru (crane)”, other motives like “yukiwa (=snow crystal) and “gosho-guruma (ox-cart)” are placed with good balance. 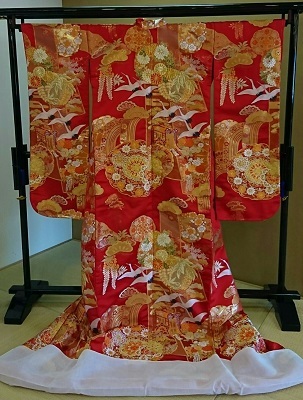 It’s a pretty and elegant kimono. 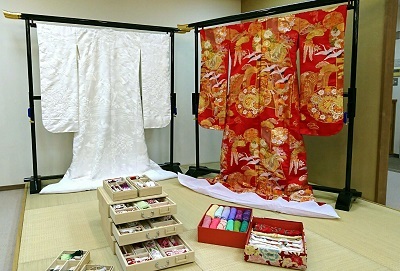 Our latest uchikake and accessories are ready to show you at LST OATSURAE-SALON. At LST OATSURAE-SALON, we propose various kimono coordination which will make the bride dream of her wedding day.